Looking for men’s gift ideas? 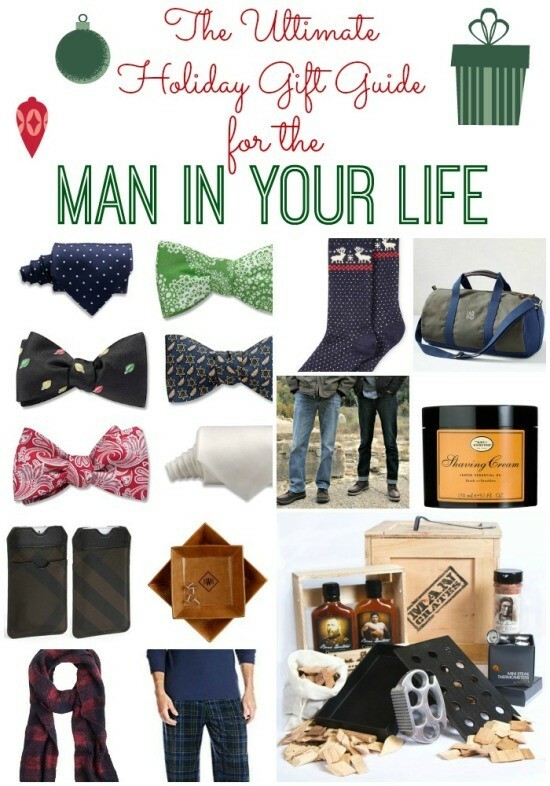 Do you have a man in your life to shop for this Holiday season? Maybe a husband, a boyfriend, your dad or brother. Men can sometimes be challenging to buy for, which requires a little creativity on our part. So let me help with that! I’ve already shared with you some fantastic hostess gift ideas, now let’s focus on the guys shall we? Whether he likes to look good, smell good, feel good or eat good – we have a gift idea for you. All of these ideas are *under $100. 1. Bow Ties – Have you noticed a trend in bow ties? They are back and men are looking better than ever. A bow tie can be worn with slacks or jeans and it just kicks their outfit up a notch. For a wide variety of bow ties, you’ll want to visit Beau Ties LTD. They have thousands of offerings from bow ties and neck ties, to apparel and accessories. Stay tuned to Mom Fabulous for a style feature dedicated to the bow tie. 2. Ralph Lauren Socks – Don’t discount the sock. At least it’s not underwear in their stocking right? These are no ordinary socks. They’re Ralph Lauren wintery Fair Isle print in a luxurious rayon-cashmere blend. Socks have never been so comfy. 3. Jack + Mulligan Duffle – Whether he takes a daily trip to the gym or weekend getaways, this Jack + Mulligan Duffle bag will fit his needs. Handcrafted in the USA and made from canvas with leather accents, it’s built to last. You can also get this bag monogrammed to personalize the gift. 4. Rugged Boots – Give them a boot that’s a little rugged and a lot cozy. By shopping for boots at Rack Room Shoes, you can take advantage of their current boot sale and their everyday Buy One, Get One 50% off. 5. The Art of Shaving Shaving Cream – Does your man need a close and comfortable shave? This lemon scented shaving cream softens and lifts the beard for a close and comfortable shave, and protects the skin from irritation and razor burn. They can use it with a shaving brush or simply their fingers. 6. Burberry Brit iPhone Sleeve – Help them keep their iPhone scuff- and scratch-free with this Burberry Brit iPhone sleeve. It’s masculine, has an understated style and is well made from leather. 7. Leather Catchalls – For the man who likes to have a place for his stuff, this set of 2 leather catchalls is a fantastic gift idea. Stash keys, jewelry, change or any personal item at the office or home. Keeping his things neat never looked so good. 8. Wool Scarf – Help him stay warm and look stylish at the same time with this J. Crew Wool Buffalo Check Scarf. A great scarf in the winter is always a good move and a smart one at that. 9. Pajama Set – This Intimo Men’s Navy Thermal Crew Top and Plaid Microfleece Pant Gift Set will be so cozy and comfortable on these cold winter mornings. He can lounge around on the weekends in style. 10. Man Crates – Here’s a way to send an unforgettable gift. Man Crates are not about neckties, cologne samples and trinkets. They’re also not about wrapping paper and ribbon. They’re about bragworthy gifts for guys such as the bacon crate, NFL Barware crate, grill master crate and more. 11. 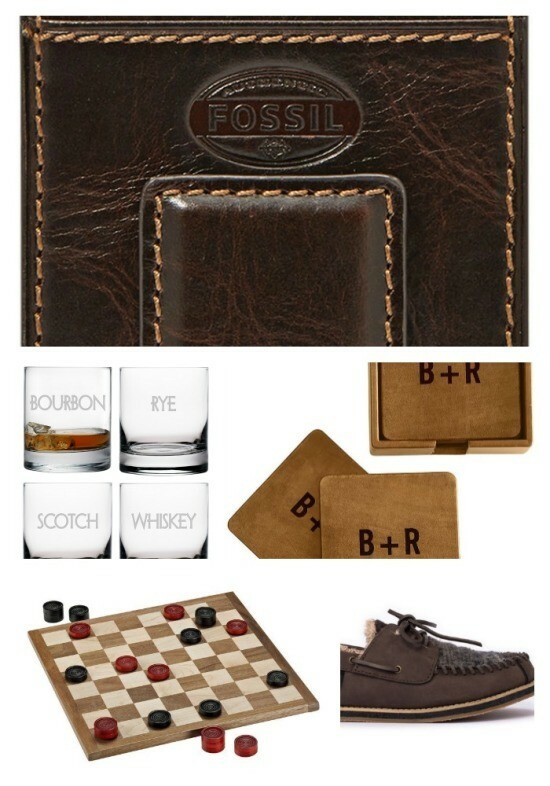 Fossil Wallet – This is for the man who is sick of carrying around a huge wallet. This sleek leather wallet from Fossil holds the essentials and features a handy money clip for cash. It’s made of leather and has nice contrast stitching. 12. Name Your Poison Glasses – Whether their poison is Bourbon, Rye, Whiskey or Scotch, this set of 4 old fashioned glasses has them covered. The glasses are sand etched and hold 13.5 ounces. 13. Leather Coasters – Help him keep water stains from ruining his night. (Or his wife’s coffee table.) This Set of 6 Rustic Leather Boxed Coasters are reversible. On one side they feature monogrammed saddle leather and on the other side classy natural chambray. When not in use, they store neatly in their own leather wrapped box. 14. Classic Checkers Set – Does he like to strategize and kick back with a good game of chess? This Classic Checkers Game featuring red and black pieces and a wooden board is not only fun to play on, but it looks super cool displayed. 15. Slippers – Help him keep his feet cozy warm and stylish at the same time with these Austin Potter Slippers from Huckberry. There’s someone in my life getting these for Christmas. It’s my teenage son, but shhhhhhhh don’t tell him.